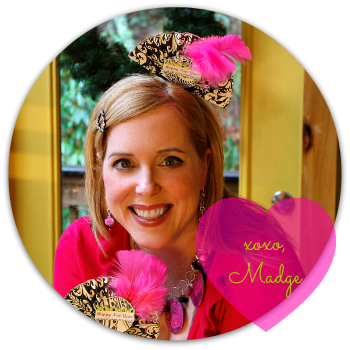 The Impatient Crafter : Bead Soup Blog Party! Isn't it Romantic? Bead Soup Blog Party! Isn't it Romantic? 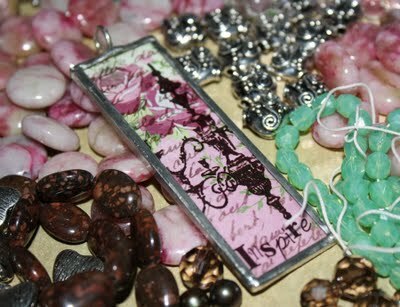 Visit the rest of the Bead Soup Blog Party HERE! I did a fair amount of ruminating about my soup. What should I leave out? What should I leave in? How many dashes of my own spices should I add? How much is too much...how little is too little?! It was a conundrum, indeed. No, it’s not necessarily full on funky Madge style, but I hopefully served the components well and made something somewhat appealing. That, gentle reader, is for you to decide. Alas it was a gloomy few days here in the Smokies, so the lighting gods were not with me, but I did effort! If I can manage to get a better shot today, I shall post! To see what the VAST INTERNATIONAL gallery of Bead Soupers have cooked up for your delight, just take a peek here! Go Check out what my partner Suzann S. Wilson of Beadphoria created with the sparkly soup I sent her and thanks to the amazing Ms. Lori Anderson for hosting Bead Soup Blog Party. You both rock! Beautiful work! So elegant and feminine! It is very romantic, and so pretty!!! I love this piece. Your work is always so wonderful! Oh Margot, this couldn't be more divine! I am in LOVE with your creation!!! It is totally gorgeous!!! You worked with your cup of soup to perfection! It's so very pretty and romantic! Love it! Maybe not so "full on funky Madge style" but really, really pretty and definitely very romantic! Gorgeous as always Margot! Yes it IS romantic! Lovely work as always, Margot! Hi Margot, I like your piece it is very pretty and femine, you did the pendant justice. Romantic indeed! You and Susan must have been cut from the same cloth. Beautifully executed design. Gorgeous. The texture of the beads an metal is wonderful. The piece is so pretty. Well done! You did just enough and just the right things to accent the gorgeous pendant. Lovely! What a wonderful focal to be able to work with!! The chain with those black beads does it for me. It just has the right balance. 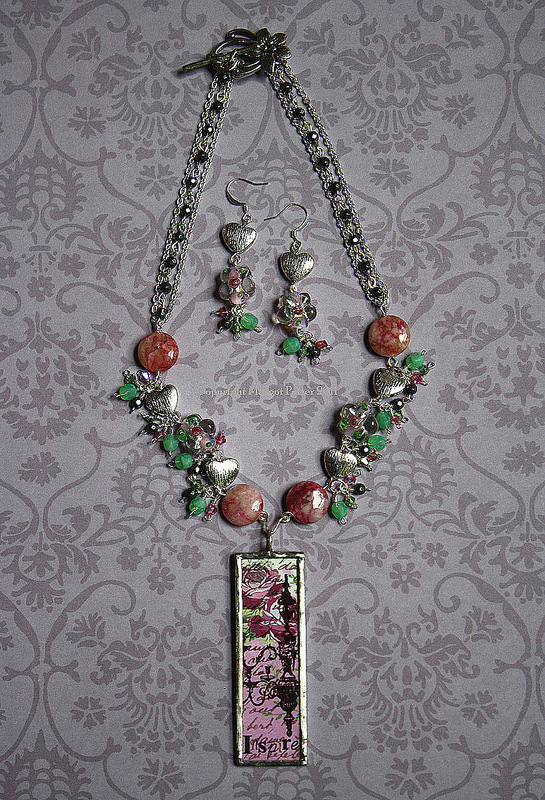 Truely romantic - a wonderful necklace! Beautiful choices from your soup, the result is gorgeous! Definitely romantic. Quite nice, I would have expected nothing less. I love it. I think you captured the essence of the soldered pendant with your design. very romantic - it's lovely! So pretty, and yes, very romantic! I think you added JUST the right amount of spice! It looks wonderful! I think you did a wonderful job. It is very romantic, elegant and feminine. And you did a great job of putting the focus on the focal. I love it. Lovely piece, and very romantic! Wonderful creativity! Simple, elegant. Beautiful. Great job showcasing your wonderful soup! Lovely! Color scheme, composition...it all works. Great job! I love what you received and what you made with it is perfect. That is a necklace I would wear again and again and again. Did I mention that I love it? Very pretty and feminine! The focal is wonderful! Your soup turned out beautiful. It is very romantic and perfect for wearing out on a hot...I mean romantic date. Why yes, it is very romantic! Love it! Your necklace is stunning! and I see you put a lot of design time in to this. I love all the components you used. Really Soup-er! Wow, that necklace is amazing! Beautiful! 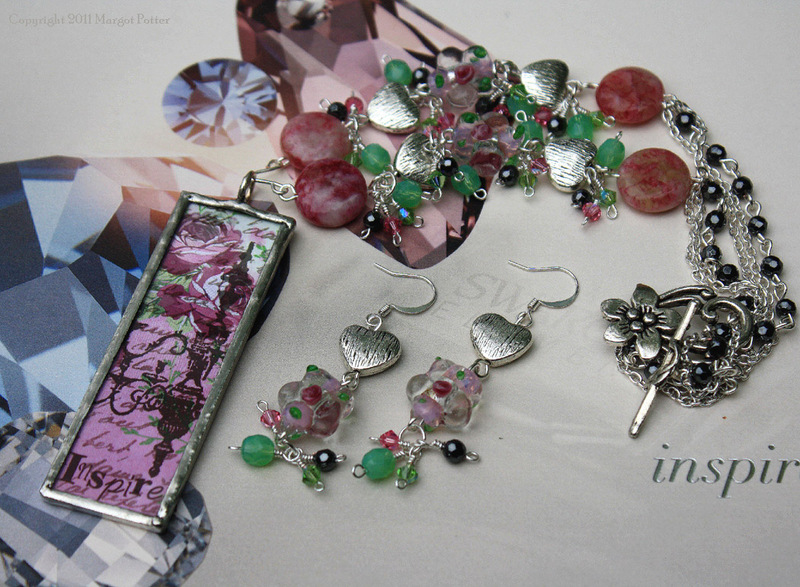 Love your design and the feminine feel - beautiful! 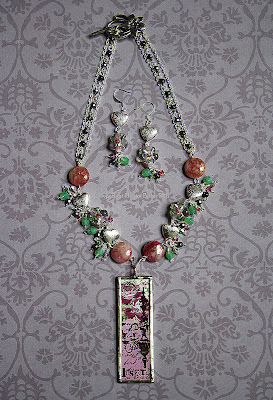 Beautiful sweet romantic necklace. I really like it. Gorgeous, a very romantic and pretty design. Lovely, feminine, textural - beautiful job! Romantic, indeed, but not too sweet - just perfect! As I have to decide, I say that the necklace is really appealing. Really romantic! Gorgeous necklace, the pendant is amazing and I love how your added the green, adds great eye appeal. Lovely necklace! One detail I like especially is how the necklace transitions into that elegant triple-strand necklace around the back. Great job! It's beautiful..it has such a nice romantic feeling. And I love hat color combination. Very pretty, the focal is beautiful and you've done a great job showing it off. Oh I love the romantic pieces you made, especially the earrings!